Below you’ll find answers to some of our most frequently asked questions to help get you started on the right path in regards to your tree issues. If you have more questions, or wish to speak with us, please contact us today at 518-792-2225. Q. 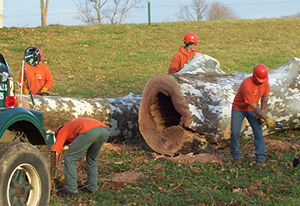 Why should I hire a professional tree care specialist to care for the trees on my property? Properly maintained and well cared for trees can actually increase the value of your property. 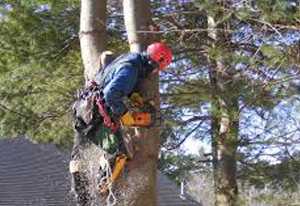 Only a licensed, professional arborist or tree care specialist, like those at Adirondack Tree Surgeons are trained in techniques to help promote tree health, identify tree issues, and provide recommendations regarding the care and maintenance of trees. Experts like those at Adirondack Tree Surgeons can provide you with the most accurate information to help determine the best course of action. Q. How do I know if I have a tree that needs to be removed? Trees may need to be removed for a variety of reasons including but not limited to disease or insect damage, storm damage sustained during severe weather, close proximity to houses, and more. Oftentimes, it is difficult for someone with an untrained eye to determine if a tree needs to be removed. We suggest you contact us for a free estimate, and our professional tree care team can perform a hazard assessment to determine the best course of action to take in regards to your tree removal. Q. How often should I prune my trees? A tree pruning and trimming schedule is something that can vary based on the tree species, size, location and more. Depending on these factors, some trees may need to be pruned every year while others should be pruned every 3-4 years. Only a professional tree care expert can provide you with the best plan for pruning and trimming your trees. Q. What should I do if I have a tree close to my house or another structure? In order to decrease the likelihood of storm related tree damage occurring during severe weather, if you notice a tree on your property in close proximity to your house or another structure, call Adirondack Tree Surgeons to check it out sooner rather than later. Our tree experts can assess the risk the tree poses to your house or other structures and determine the best course of action, whether it be to remove the entire tree or remove branches that pose a threat to the structure. Let us help you prevent a potentially dangerous situation by calling us for a free estimate. Q. If a tree needs to be removed, is my property protected? At Adirondack Tree Surgeons, we take extra measures to ensure your property is protected and that we minimize impacts to the landscape. All of our experts are experienced in all types of removals and pruning. We utilize the newest equipment and latest techniques to ensure the job is performed efficiently, effectively and with minimal damage to the surrounding area. If you have questions, or need more information about our professional tree services, please contact us today at 518-792-2225 for your free estimate! For over 30 years, Adirondack Tree Surgeons has provided professional tree services to Upstate NY & the Adirondacks including Clifton Park, Ballston Spa, Malta, Saratoga Springs, Glens Falls and throughout the Capital Region.